A XmlDataProvider-Element is declared as a logic resource. You simply set the Source-Property to a XML-Document and optionally set the XPath-Property. The default value of the IsAsynchronous-Property of the XmlDataProvider is true, so your client won’t freeze if you specify a url as the source. 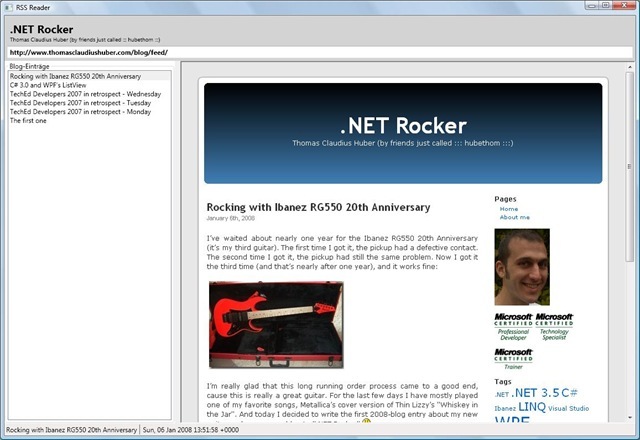 The following XAML creates a simple rss-reader. The root is a Window object that contains a XmlDataProvider inside its Resources-Property. The XmlDataProvider loads the feed of this blog and its XPath-Property points to the blogs items. The elements inside the Window are indirectly bound to the XmlDataProvider. They use the DataContext specified on the DockPanel. The special thing of the Bindings on this elements is that they do not directly point to the XmlDataProvider. Instead the Bindings start at the /rss/channel/item like specified in the XPath-Property of the XmlDataProvider. If you want to point directly to the XmlDataProvider-object, you’ve to set the BindsDirectlyToSource-Property of the Binding to true. This is used by the first TextBox. It allows the user to change the Source-Property of the XmlDataProvider to navigate to another feed like http://blog.trivadis.com/blogs/MainFeed.aspx. The Binding for this TextBox also specifies that the UpdateSourceTrigger is PropertyChanged. Without this, the Source would be updated on LostFocus, cause the TextBox.TextProperty has specified this behaviour in its metadata. I love you blog. Great content and the best formatting ever. I need to upgrade my blog to look like yours. I’m having trouble getting this to work. If I point it at a local xml file then all works fine, as soon as I point it at the same xml file via http then no data gets loaded. I don’t get your feed loading in either. maybe a setting of your firewall. Did you also install IE 8 Beta1? There’s a problem with loading Images from Web-URIs, if IE8 Beta1 is installed. Maybe that’s also the case with Xml-Sources from the Web. Find a description on channel9. You can easily try to paste the following code to XAMLPad, if that works, it’s not the IE-bug above.